The exciting conclusion to Dynamite's very entertaining miniseries, King: Jungle Jim, arrives with issue #4 and while it may not have been the epic ending we had hoped, it still remains a winner. It's the final showdown against Ming's forces with one shot at saving Daris. Jim's brilliant plan? Get the jungle drunk. Wait, what? Ever since we were introduced to Jungle Jim (in issue two no less) he's been an amusing but powerful hero. And not a hero in the typical sense. Jim can control and communicate with the plants, trees and animals of the jungle but behind his bravado and wisecracks, he wants to empower his allies. It makes what could be perceived as a silly drunk loud mouth a much more empathetic figure. There is a method to his madness. The series works because Paul Tobin knows how to create engaging characters whether it's the lead or a second or third supporting character. The first issue is a great example of developing the plot and exposition through everyone except the titular character who we don't really meet until the second issue. That takes some creative freedom and a set of balls the size of pumpkins to pull off. None of it would work without Tadd Galusha's detailed and expressive pencils (issue four included layouts by Sandy Jarrell). The layouts are fairly simple but very effective especially during the final battle. There is a fluid rhythm to the panels, one panoramic shot after another, to emphasize the forward attack by our heroes. Luigi Anderson's bright sunlit colors keep the tone of the series light. Everything is resolved with few surprises and rather one-sided. It seems brief too, but perhaps I just wanted to spend more time with these characters. Tobin has created a fun universe with an obscure hero that has been a complete delight. 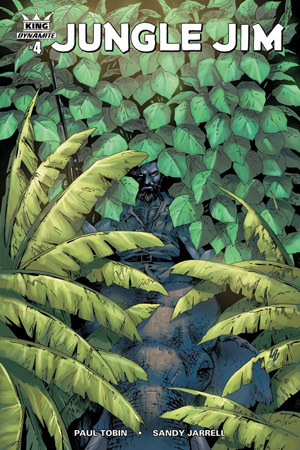 I'm hoping we'll see more of Jungle Jim. It's been one of the best surprises in comic books this year. To clarify, artwork by Tadd Galusha was not "included" in the book - artwork by Tadd Galusha WAS the pencils and inks of the entire issue. I know there was some confusion on our part as to how much Galusha contributed but if that's the case I'll update the review. That would be wonderful, thank you!